Splendid reader Bob Gardner sent this comment to Two-Daily Town yesterday in response to our post Lauren Bacall Killed by Boston Herald. 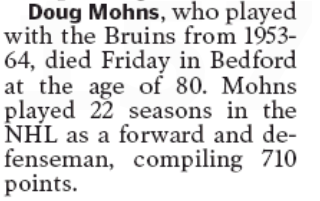 On the other hand, I haven’t been able to find any mention in the Globe today of the death of Doug Mohns. Mohns was one the great Bruins from the 1950′s and “60′s. 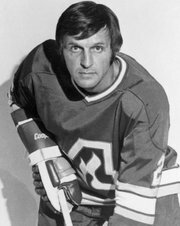 Mohns was considered to be one of the best Bruin players at that time and (if I remember right) was one of the few players of that era who wore a helmet. 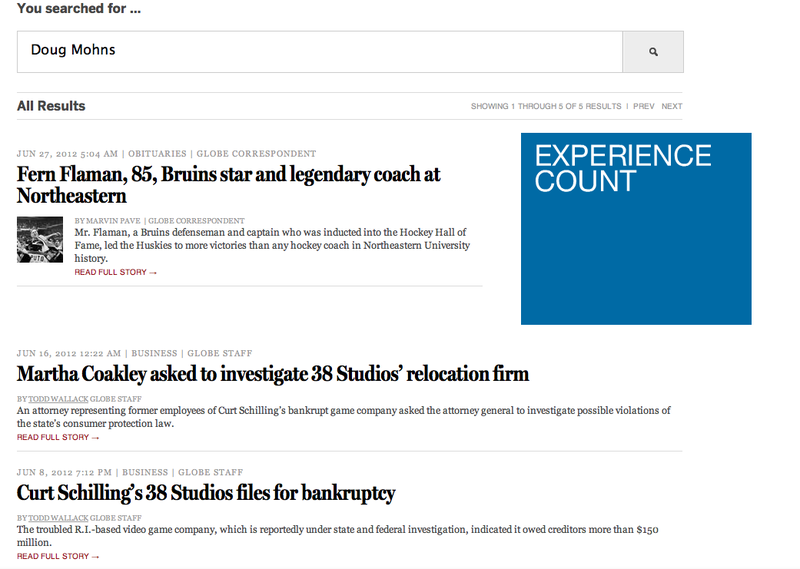 Mohn’s death was reported in the NY Times today but my search of Boston.com turned up nothing. That’s especially ironic, since not only did he play in Boston, but (according to the Times) was a resident of Bedford Mass at the time of his death. Doug Mohns, a durable and versatile skater who lasted 22 seasons in the National Hockey League, playing in seven All-Star Games, died on Friday in Reading, Mass. He was 80. The cause was myelodysplastic syndrome, a blood and bone marrow disorder, said his wife, Tabor Ansin Mohns. For most of his career, which extended from 1953 to 1975, Mohns was a stalwart of the old, compact N.H.L. — when there were only six franchises, rivalries were especially intense, no one wore a helmet, and players were intimately acquainted with the strengths and weaknesses of players on every other club. He played 11 seasons for the Boston Bruins . . . The Boston Herald hasn’t done much better. There’s only this mention that was tagged onto the February 9th Bruins Notebook (no link because the Herald is the Bermuda Triangle of search engines). Rest in peace, Doug Mohns. Just not in the Boston dailies. This entry was posted on Friday, February 14th, 2014 at 11:24 am and is filed under Uncategorized. You can follow any responses to this entry through the RSS 2.0 feed. You can leave a response, or trackback from your own site.